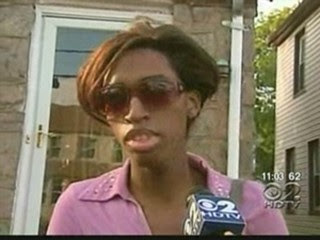 This is my neighbor, Carmella Etienne. She lives nearby in our St. Albans, Queens neighborhood. St. Albans is a highly residential area with well-kept homes and quiet tree-lined streets. It's a community of home-owning professionals, suburban character, and a church on almost every corner. In fact, the largest black congregation, Allen A.M.E. Church, has been a St. Albans fixture since the 19th century. It's one of the largest megachurches in New York State, and its pastor, former Congressman Rev. Floyd Flake is well-known as a political heavyweight in local and national politics. Both President Clinton and Secretary Of State Hillary Clinton made campaign stops at Allen AME, and St. Albans, testimony to the area's political significance. So what does all of that have to do with Miss Etienne, a 22-year-old transgendered woman who moved to St. Albans from Haiti six years ago? Well, a week ago today, she was horribly attacked by two homophobic thugs who threw rocks and bottles at her, all the while screaming anti-gay slurs and making death threats against her. "If you ever walk this block again", one of her attackers warned, "we'll slit your throat." As I told fellow blogger Rod McCullom, a large crowd had gathered at the corner of 116th Avenue and 199th Street to watch the attack. That's exactly what they did. They watched. They didn't intervene to stop the attack. They didn't dial 911. They just watched. Encouraged by the apathy of my neighbors, Etienne's two alleged attackers, Nathaniel Mims and Rasheed Thomas, told Etienne "Go ahead, call the police. They don't care about people like you", as she tried to reach the NYPD on her cell phone. Cops from the NYPD's 113 Precinct, which arrested the two bigots, quoted Thomas as saying "I called her a bunch of names. I called her a [deleted] but she didn't see me throw anything." Not "I didn't throw anthing", but, "she didn't SEE me throw anything". Imagine that. Etienne was treated for lacerations and bruises at a local hos[pital, and now says she is afraid to leave her home. Now, in the week that has elapsed since this vicious attack, only one public official--Queens District Attorney Richard Brown--has made a statement on the assault. Says Brown, "Everyone should understand that these cases, whether they involve ancestry, age, gender, or sexual orientation, will be very vigorously prosecuted, not only because of the effect they have on individuals, but on the community generally." He is the lone voice condemning the attackers and their crime. Not one word of protest or disgust has been uttered by my neighbors, clergymen, or other public officials in regards to this hate-fueled assault. Rev. Flake hasn't said anything. Nor has our local State Senator, Malcolm Smith, whose public offices are just steps from the site of the attack. We haven't heard from City Councilman Leroy Comrie, whose home is also near the attack site. I can only surmise that beneath this quiet suburban facade that is my neighborhood, there lies a deeper, uglier truth: you will be tolerated, as long as you do not publicly identify yourself as LGBT. Cross that line, and you might get hurt, and we, your neighbors, and elected officials, will not do or say anything to help you. We'll watch you get beaten down, blame you for "behaving provocatively", and hose your disgusting, gay blood off our streets when it's over. This is what my neighbors, local clergy, and elected representatives are telling me by their concerted lack of words or action. They are telling me I cannot be out, proud, and safe on the streets of the neigborhood where I live. I am seriously considering moving away, and leaving the people of St. Albans to live with themselves and their hatred.